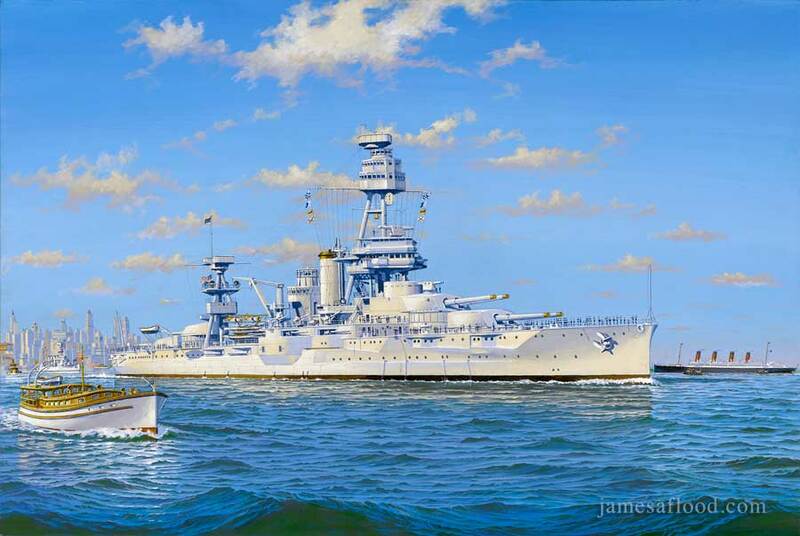 Painting depicting USS Texas departing New York Harbor in 1939. This magnificent ship, the only remaining dreadnaught battleship in the world to be preserved of her era, is now moored at the San Jacinto Memorial, LaPorte Texas, where she is open to visitors. This painting shows her in her prime, paintwork spotless and brightwork shined, in her Atlantic flagship role. She is depicted in this painting departing New York Harbor around 1939. Much like her sister ship USS New York, USS Texas was slow, hard to ahndle, poor in rough weather after her rebuild in 1926 and deemed in appropriate for first line war service (referenced from Janes Fighting Ships 1935). Consequently both ships spent much time as training ships and relegated to Atlantic service. Nevertheless, they both looked quite stunning in their pale gray peacetime livery.